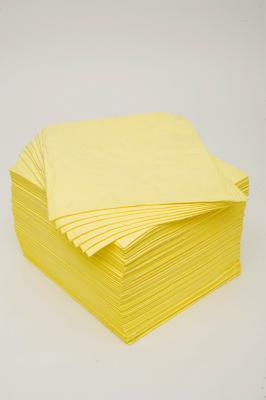 These yellow, hydrophilic, melt-blown polypropylene pads are designed for aggressive fluids and solvents. The dimpled, standard single-layer offers improved strength and durability, and anti-static treatment dissipates potential static build-up. They are most effective when used in conjunction with a loose particulate sorbent, such as Kleen Sweep. For use on all hard surfaces to contain and absorb water-based liquid spills. Can be used on most liquids, including glycols, mild acids and alkalis, but cannot be used on oxidisers. Commonly used in the automotive, industrial, commercial markets, warehousing, waste management and manufacturing industries. Highly absorbent — each pad is able to absorb up to 500mL of a wide range of fluids. Non-stick and anti-static — won’t stick to concrete and is lint-free, with a quick wicking response.